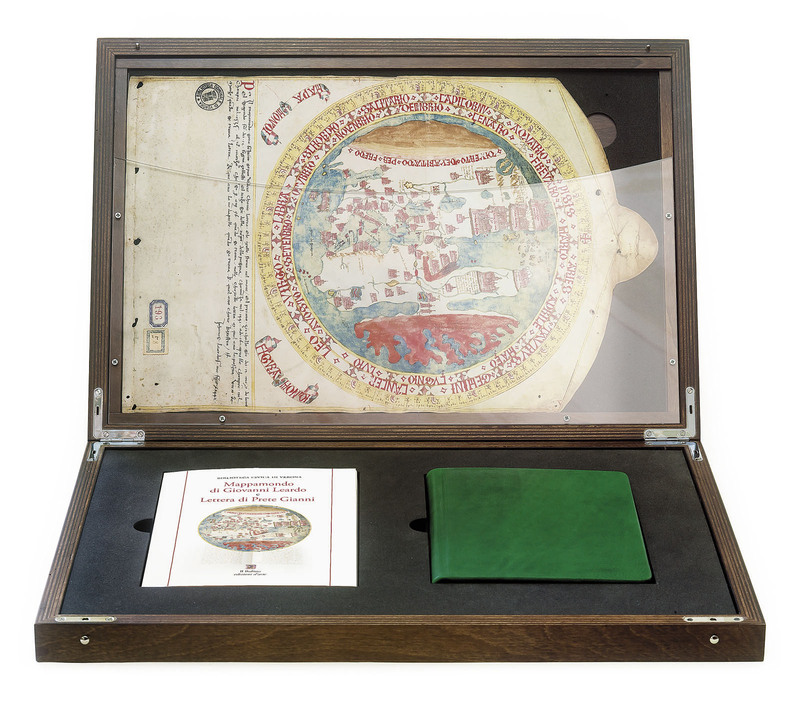 This facsimile edition combines two mid 1400s documents: a world map and a manuscript, both handwritten and preserved in Verona, in the Civic Library. 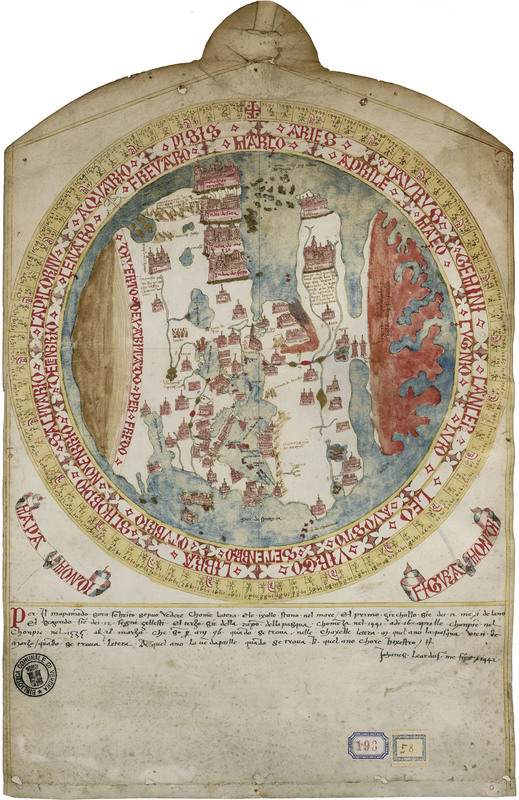 The WORLD MAP (ms. 3119) was created in 1442 by GIOVANNI LEARDO, Venetian cartographer, on a parchment sized 28×43 cm; the map (east on top) shows Europe, Asia and Africa. 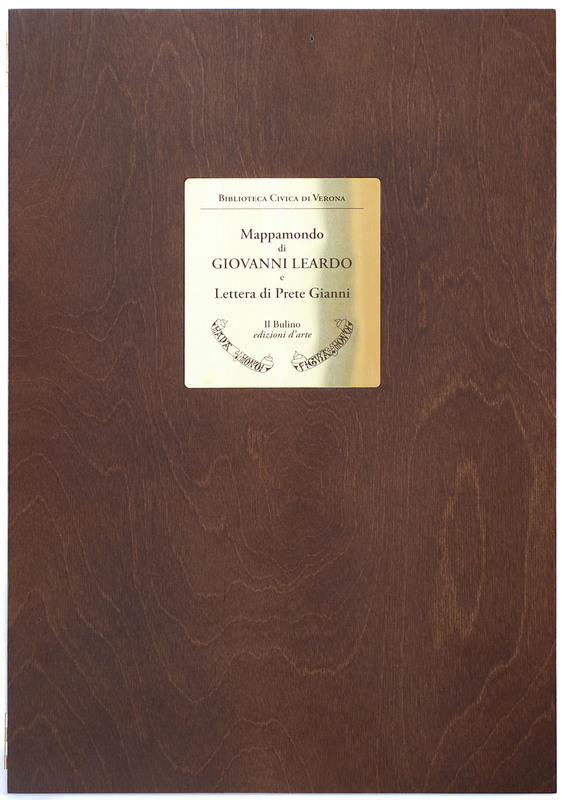 Giovanni Leardo was contemporary with other great Venetian cartographers such as Andrea Bianco and Fra Mauro. He left us three maps: the Veronese Mapa mundi (1442), the planisphere of Vicenza (1448) and the one of the American Geographical Society of New York (1452). The codex 398, handwritten on paper, contains the LETTER OF PRESTER JOHN, a powerful eastern king about whom fantastic stories were told for at least 4 centuries. 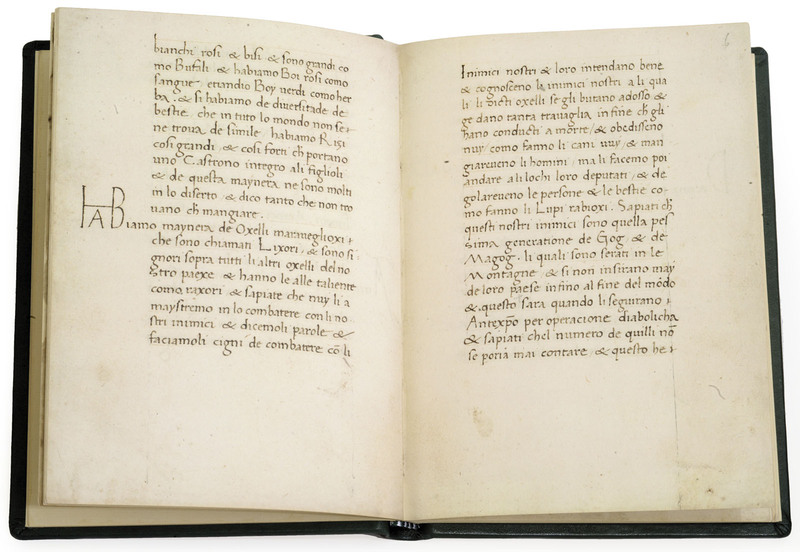 The codex (64 pages sized 13,8×18,8 cm) is written in beautiful calligraphy, in Feliciano’s style; a green leather binding reproduces the original one. The Letter of Prester John is one of the most fascinating documents of the Middle Ages: it appeared at the end of the twelfth century, addressed to the kings of the time, and it was rapidly translated into many languages, enjoying an incredible success. Its list of miracles, coupled with the expectations created around the Christian character of a kind of earthly paradise, led Europe to engage in research: that is why it can be considered co-responsible for the great geographical discoveries. 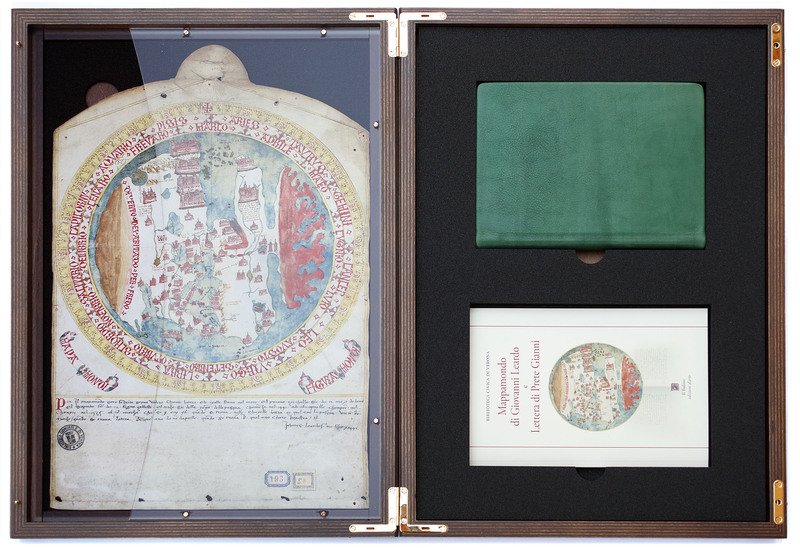 Leardo’s map and Prester John’s manuscript are presented in a special wooden case with a brass plate on the front. 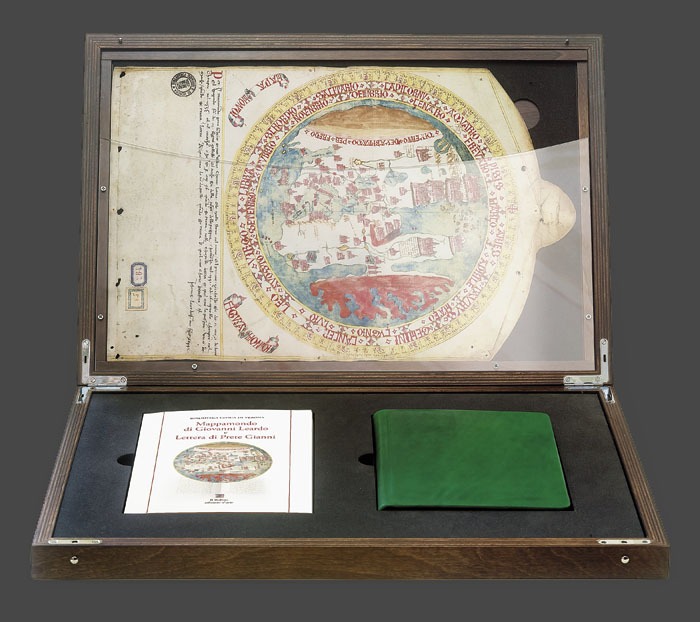 The map, protected by a plexiglas, and the letter are accompanied by a commentary volume in Italian and a guarantee certificate. The edition consists in 499 numbered copies.